Mowing Wet Grass? Here Are The Top 20 Tips To Know! It’s very amusing. Mowing wet grass, it seems, has somehow become an ignoble faux pas. The intensity in the way that many preach of its prohibition and the consequences of failing to do so can rightly be compared to other hard and fast rules such as, “Don’t shave against the grain”; “Don’t button your jacket’s bottom button”; and “Don’t overcook the pasta”. What would you do, though? The lawn has practically turned into a swamp and the grass grown unruly to the windows sills. You’ve half-postponed and half-procrastinated mowing your lawn for a while now because of the inclement weather. It can’t seem to stop raining and the sun hasn’t shown itself like a condemned fugitive. I’m sure you can relate if you live in a country or region that’s known for wet gray gloomy days. Okay, maybe your yard isn’t a swamp yet. You are, however, thinking if it’s a good idea to mow your lawn after last night’s rain shower. Read more: When To Apply Lime To Lawn? You’ve heard and read and been advised that mowing grass when it’s wet is a bad idea. “It hurts the soil and the grass and your mower. And it stains everything”, they say. The weather forecast isn’t very promising, though, so waiting for your lawn to dry may be out of the question. The grass keeps growing, as they say. Can you mow your wet lawn? The simple answer is, yes, yes you can. Should you? Ultimately, it is always better to trim your lawn when it’s dry but it is still a better option to mow wet grass than to let it grow too long. In addition to the unsightly appearance of tall grass, and the stress of mowing it, the grass’ health also suffers. Its resistance to disease is also diminished as cutting of long blades hinders growth and weakens the grass making it more susceptible to weeds and pests. 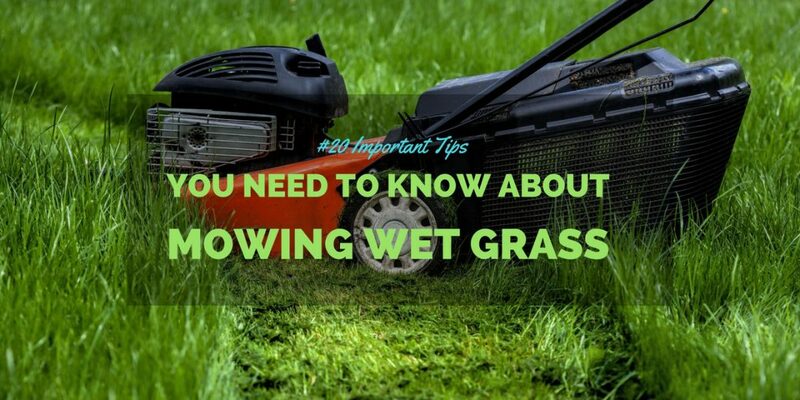 But before you put on your galoshes and run to your mower let’s first understand why there is such strong advice against mowing wet grass. Clumps invite fungi and other diseases and if clippings become too thick the mown grass may not get enough sunlight and nutrients grow. Clippings will stick to mower blades and the underside of the mower, and can eventually clog the motor. Far be it from me to hinder your “Green thumb” goals, but yes, those grass clippings (specifically, the chlorophyll in them) will stain green everything they land on – your pavement, the white picket fence, your car, the walls and maybe your cat. You may need to rake all clumps on the lawn to scatter clippings. You may already know how slippery fresh-cut grass is. So fresh-cut wet grass may have you landing on your bottom or worse quite a number of times. The grass may be soft but the mower or its blades, decidedly, are not. Mowing on soil that is soaked and soft with water can create ugly ruts and bald spots. In addition to uneven soil, wet grass bends due to the weight of water as opposed to being upright when it is dry. It is much harder, then, to get an even and clean cut because the grass is limp. This is vital for the health of your lawn. Think of cut grass like you would a cut on your skin. An uneven, jagged cut will heal much slower than a clean one and is more likely to be infected. Make sure you have a scalpel of a mower blade instead of a blunt serrated knife. Your grass will thank you for it with bright green colors and fuller denser foliage! If your lawn already has fungi problems, do not mow it when wet. Running a blade through them will only exacerbate the problem. Now, the grass has grown since you’ve started reading this article. If you, after considering the risks and disadvantages listed above, still think mowing the grass now before it gets too long (or the weather too wet) is the better option then let’s mow it properly. Whatever’s worth doing, is worth doing well. Take a test walk on your lawn. If the steps you take sink as you walk or yo﻿ur shoes are leaving deep impressions on the soil wait until the soil is dryer and more firm. Mowing uneven soil can also damage it through compaction or the ugly ruts that we’ve talked about. Remember, we want a cut as clean and even as possible. If your blades have become dull consider having them sharpened or getting a replacement. Make sure to disconnect spark plug boot from the plug itself before attempting any repairs or maintenance. Remove any dirt and old debris to avoid buildup and clogging. Note that, as a safety feature, some mowers automatically stop when there is too much grass buildup. Do not use an electric mower that uses an extension cord for power. Water and electricity don’t mix. You know this. Wear shoes that have good traction or have anti-slip soles. Remember, Wet grass is slippery enough, but freshly – cut wet grass even more so. Mow across raised ground instead of up and down. Remove obstacles that are not fixed and take care to avoid the ones that are - You know, like trees. You’ve now made it as safe as possible to mow your wet lawn. Before you pull the starter rope, though, take note of these very important rules and points on mowing wet grass! Keeping grass at this level promotes optimum sunlight absorption keeping the lawn healthy. It looks great too. Take for example Tall Fescue. The ideal height for it is 3 inches*. Therefore, the right time to trim it back to its ideal height is when the grass has grown to 4.5 inches tall. When dealing with wet grass, focus on trimming in increments until you reach the ideal height. Grass should be cut higher than usual. This also gives the lawn a chance to dry even further. Remove any lawn striping rollers or kits off your mower. Yes, we all like the look of a striped lawn but with wet grass, focus on a clean cut as the rollers will press the grass down even further. Keep yourself and the mower’s blade at a low speed for more control. This also allows the mower’s blade more time to cut as it keeps up with the extra stress of wet grass. To avoid clogging, frequently check and clean blades, air inlets, and filters. Don’t leave clumps of grass on your lawn. Pick up or rake clumps. This helps keep your lawn fungi and disease free! Alternatively, you can mow over the clumps to collect in your mower bag. Purchase enough fuel to last two to three weeks of use. Only use fuel with a max bioethanol content of 10% and utilize a fuel stabilizer. The stabilizer keeps moisture from contamination fuel with bioethanol. Higher grass in these areas compensates for lower sunlight exposure. What’s the best way to dispose of those wet clumps of grass clippings? The only options would be side-discharge or bagging. Mulching simply creates too big a risk for grass buildup and clogging in your mower. It’s also a much slower mow. The best option, though, is the side-discharge. Using this feature allows you to mow faster and is generally better at handling thick clumps while minimizing clogs. Remember, bagging grass clippings and dumping as trash is illegal in some regions. If allowed in your area, choose to recycle grass for compost. Fresh-cut grass has a lot of nitrogen and nutrients vital for soil and plant health. Regularly empty bag when mowing wet grass to keep weight down. A good technique is to mow later in the day. The second pass will help better scatter clumps and allow for grass-recycling. Hopefully, the sun soon shines where you are and happy mowing! HowStuffWorks.com Contributors "Should you bag your grass clippings?" 9 March 2011.